Ajit Pai, the Chairman of the Federal Communications Commission (FCC) has achieved the impossible. He has managed to take brazen hypocrisy to new heights; something which many observing the current US administration may think is nigh on impossible. 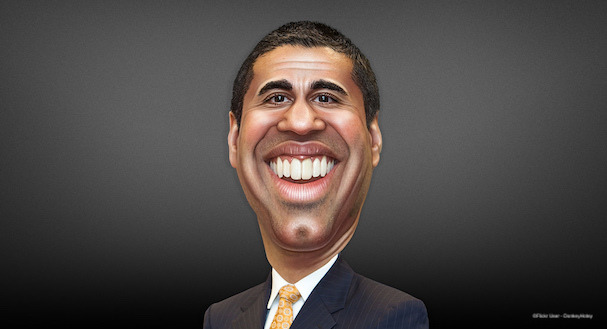 If you’re trying to place the name Ajit Pai, he is the guy who has removed online privacy protections and rolled back net neutrality in the USA. In doing so, he has made the internet a far more dangerous and insecure environment than it was before. Why has he done this? Well, Pai likes to position himself as a free-trade conservative who doesn’t really believe in state regulation and advocates self-regulation and market forces to keep big business in check. As such, he may not seem the right person to be heading up the US’s Communications regulator, whose purpose is to do the thing he openly opposes. When you factor in the fact that he is a former employee of Verizon, one of the very ISPs the FCC is charged with regulating, the red flags are flying pretty high. Unfortunately, there is nothing in his actions as chair of the FCC to dispel the suggestion that he is basically a pawn for the interests of the big American ISPs. Pai has granted them their wishes on privacy and net neutrality to the chagrin of online privacy advocates, many tech companies, and most regular internet users. Now, in a truly astonishing blog post on Medium entitled ‘What I hope to learn from the Tech Giants’ he has advocated saddling internet companies like Facebook, Twitter, and Google with the same regulations as ISPs. This is a line of argument which ISPs and their Washington lobbyists have been pushing for ages. Indeed, the main points of Pai’s blog post could have been lifted word-for-word from one of the press releases. His argument is that because big tech companies have a big influence over consumers, they need to be regulated. For the arch anti-regulator to be pushing this line is the epitome of hypocrisy and, were Pai an elected politician, it is something he would struggle to live down. But his blog also avoids addressing the most fundamental criticism of this proposal; the obvious differences between ISPs and tech companies. ISPs have a captive market. Just a handful of big ISPs control the overwhelming majority of the US market. And they wield a huge amount of power. They have complete control of internet connections, the data people are sending and receiving, and what websites they can and can’t access. Tech companies like Google, Facebook, and Twitter, offer online services and information which people can choose to use or not use. It is a big difference and something which ISPs have conveniently overlooked in their push for regulatory parity. Pai also calls for greater transparency of tech companies and suggests that if they fail to offer it, the US Government, and specifically the FCC, should force them to do so through regulation. This is the same FCC that tore up transparency and disclosure rule when railroading through their net neutrality rollback. That action alone makes it hard to take Pai’s calls for online transparency seriously. Likewise, his suggestion that tech companies are a threat to online privacy reeks of hypocrisy given that he axed online privacy in the USA in support of ISP profits. Pai is right to suggest that these tech companies need to be more transparent. He is right that they wield a huge amount of control over the information people can access. And he is right that many people don’t understand how these tech companies use their personal data. But the argument that they should be regulated in the same way as ISPs simply doesn’t stand up to scrutiny. They are very different businesses which pose very different threats to consumers. The worrying thing is that Pai isn’t a lone voice on this issue. Many right-wingers and Republicans are making similar cases in private and in public. With calls for regulation growing, the real concern is it could lead to tech companies finding themselves being censored or otherwise exposed to political interference in the USA. Such a move would be hugely concerning to US consumers already reeling from Pai’s attacks on online privacy and net neutrality. The likelihood is that even more would find themselves turning to VPNs to protect themselves online and ensure they could access their favourite websites without political interference. It is early days yet but calls for regulation are growing. And if it is left to Ajit Pai to oversee things, the impact of internet freedom in the USA could be devastating.